Obsolete + "elYte!" = obsolYte! 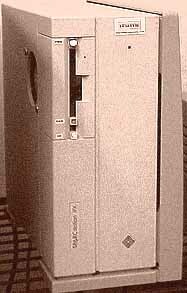 This is my site dedicated to vintage computer hardware, classic systems, and especially workstations or 'mainframes' we lusted after when 'personal computers' were mere 8-bit clunkers. Obsolyte.com is hosted on a Sparc IPX, running RedHat Linux 6.0 for Sparc (UltraLinux) and the Apache Web Server. This particular machine has 64 Megs of Ram and a 500 Meg HD. BogoMips = 79, which makes it just a bit faster than a 486/66 PC. Truly obsolete and yet, very cool! This Sparc IPX also has a few modifications that I added, such as extra LED "status lights", and extra internal fans. The IPX is a very 'hackable' machine, with all kinds of modifications possible. NOTE: All older "tidbits" have been moved to the NEWS PAGE. Suns At Home -- June 1st 2006 -- A mailing list for people who use their SUN equipment at home. JOIN!!! OBSOLETE -- September 16th 2004 -- The "obsolete" website is 99% SGI Info and it's all good stuff. From the Octane to the really antique Personal Iris, it's got good detailed information regarding the hardware, and lots of good pictures. Defintely worth exploring! Sun 3 Zoo -- September 16th 2004 -- Peter's Sun 3 Zoo is a great archive of relevant material relating to the old "Sun 3" series (Motorola 68020 and 68030 CPU'ed Sun Systems), and it's available in English or German. Most of it relates to keeping a bunch of these old machines going (the zoo). Defintely worth checking out, the number of Sun 3 sites that still exist these days is growing smaller all the time.